Former Wigan Athletic star James McClean has been nominated for the Irish Sportsperson of the Year award. The Republic of Ireland international, who played for Wigan from 2013 to 2015, was highly influential in his country’s World Cup qualification campaign. 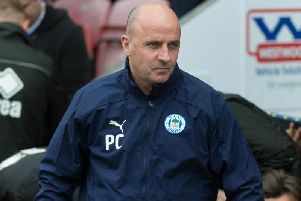 He scored four goals for Martin O’Neil’s side before they were defeated in the play-offs by his former Latics team-mate William Kvist’s Denmark. McClean’s goals included a brace in Moldova, and winners against Austria and Wales, and aside from his fantastic on-field performances McClean has been very active throughout the year carrying out charitable work and making donations for children in need. In February the 28-year-old surprised a family in Cork and donated €1,000 to help fund Faith Browne’s life-changing operation. She had been diagnosed with Spastic Diplegic Cerebral Palsy and a rare hearing condition called ANSD. During his time at Wigan, McClean got involved with helping a variety of causes, including becoming an ambassador for the Carrie-On Fighting Fund. Schoolgirl Carrieanne North was diagnosed with a condition known as RYR1 in 2013. Her family helped raise awareness for muscular dystrophy, as well as raising funds for Alder Hey hospital. McClean became a role model for the young-girl, with her joining him on the field as a mascot against Derby County in December 2013. McClean faces WBA title holder Ryan Burnett, the Hurler of the Year Joe Canning, Para-cycling duo Katie-George Dunlevy and Eve McCrystal, Women’s footballer Noelle Healy, Para Athletics World Champions Michael McKillop and Jason Smyth, Gaelic footballer Andy Moran, Ireland scrumhalf Conor Murray, Rowing World Champion Paul O’Donovan, Horse-racer Robbie Power, and boxers Katie Taylor and Joe Ward on the shortlist for the award. The RTE Sport Awards will be live on RTE Two at 9.15pm on Saturday, with the winner announced on the evening. Fans can vote for their winner by visiting www.rte.ie/sport and following the links, with the voting being available until the award winners are revealed on the night.